We have Just Sold out of Star Wars A New Hope Mini Cell. Not to Worry! Fill in the Notify me When Available and you will be the first in line for our restock of Star Wars A New Hope Mini Cell !! From the Star Wars collection by Filmcells Ltd.. Star Wars A New Hope Mini Cell. Film cells are hand selected from the actual 35mm movie film! The actual strips of film vary from piece to piece as they are hand picked from reels of film. 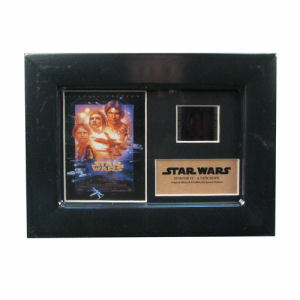 Film Cell measures 7 inches wide by 5 inches tall and comes with a certificate stating its authenticity. Filmcells Ltd. Star Wars Film Cells shipping from Canada. No Surprise Border fees or Customs!